There is a reason I only have two pictures to commemorate this event, I took the camera, but forgot the batteries were dead! 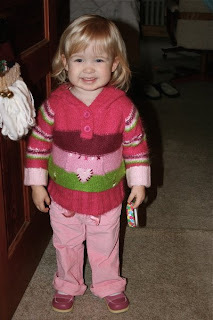 The second pic is of Hadley SO excited to see Elmo before we left. The first pic I couldn't resist, it is of the 8 dollar balloon we got suckered into at the show. They are smart. At intermission they have two guys come down the aisles with about a hundred Elmo balloons. 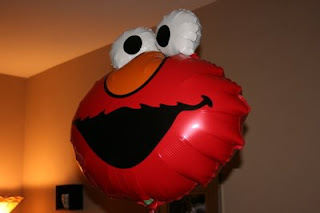 How could we say no when our daughter looks at us and says, "I would like an Elmo balloon please". Seriously. We had a great time. Mike and I both had tears in our eyes watching Hadley's face light up when she realized all her best Sesame Street friends were right in front of her. It was one of those parent moments we'll remember and cherish forever. We did however miss our friends Joe and Joseph who couldn't join us because of the terrible weather, we missed you very much!